The 4th of July is commonly associated with fireworks, parades, barbecues, carnivals, fairs, picnics, concerts, baseball games, family reunions, and political speeches and ceremonies, in addition to various other public and private events celebrating the history, government, and traditions of the United States. The Declaration of Independence was signed on July 4, 1776, declaring independence from the Kingdom of Great Britain. I've include a special video triubte to say "Happy Birthday America". Celebrate the Fourth of July with Independence Day quotes, trivia questions, and patriotic military video tributes. Enjoy your picnic and fireworks. 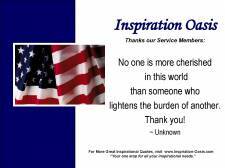 Remember and appreciate our service members. I hope you enjoy this video tribute to celebrate America's birthday. The music is "Proud to be an American" by Lee Greenwood. 1. What was the main reason the U.S. declared independence? 2. How many people signed the Declaration of Independence? 3. In what city was the Declaration of Independence signed? 4. Whose signature is the largest on the Declaration of Independence? 5. Who was the king of England when the colonies declared their independence? 6. How many people were living in the U. S. in 1776? 7. When did the Liberty Bell crack? 8. When did the Fourth of July become a national holiday? 9. How did the name “Uncle Sam” originate? 10. Why were the stars in a circle on the first flag? 1. We declared independence because we were taxed without representation. 2. 56 people signed the Declaration of Independence. 3. The Declaration of Independence was signed in Philadelphia, Pennsylvania. 4. The largest signature on the Declaration of Independence is John Hancock’s. 5. George III was king of England when the colonies declared their independence. 6. There were 2.5 million people living in the U. S. in 1776. 7. The first Liberty Bell cracked when it was being tested. It and the second bell were re-melted and forged again. The third Liberty Bell cracked in 1835. 8. This is the only three-part answer to the Fourth of July Trivia Questions. The Fourth of July became an unpaid holiday for federal workers in 1870. In 1938 it became a paid holiday, and in 1941, it was declared a federal holiday. 9. The name: Uncle Sam” originated in 1812, when a meat packer by the name of Sam Wilson provided meat to the U. S. Army. Someone saw the meat shipments that were stamped with U. S. and joked that the initials stood for "Uncle Sam" and the name stuck. 10. The stars were in a circle on the first flag to show that all the colonies were equal. "England cannot definitively determine a date of origin. It is simply too long ago. China struggles with the same problem. It was developed long before history was seriously documented. "We on this continent should never forget that men first crossed the Atlantic not to find soil for their ploughs but to secure liberty for their souls." "Our flag is red, white and blue, but our nation is a rainbow - red, yellow, brown, black and white - and we're all precious in God's sight." "Only our individual faith in freedom can keep us free." "Freedom is a system based on courage." "The 4th of July combines the two things Americans love most in one day: alcohol and explosives." "Republicans believe every day is the Fourth of July, but the democrats believe every day is April 15." "Many politicians are in the habit of laying it down as a self-evident proposition that no people ought to be free till they are fit to use their freedom. The maxim is worthy of the fool in the old story who resolved not to go into the water till he had learned to swim." "All the great things are simple, and many can be expressed in a single word: freedom, justice, honor, duty, mercy, hope". ~ .Martin Luther King, Jr.
"In a chariot of light from the region of the day, The Goddess of Liberty came She brought in her hand as a pledge of her love, the plant she named Liberty Tree." ~ Lee Greenwood - lyrics to "Proud to be an American"
"A man's country is not a certain area of land, of mountains, rivers, and woods, but it is a principle and patriotism is loyalty to that principle." "It is the love of country that has lighted and that keeps glowing the holy fire of patriotism." "That’s why I stand here tonight. Because for two hundred and thirty two years, at each moment when that promise was in jeopardy, ordinary men and women – students and soldiers, farmers and teachers, nurses and janitors — found the courage to keep it alive." "When I die, I desire no better winding sheet than the Stars and Stripes, and no softer pillow than the Constitution of my country." "Patriotism is like charity — it begins at home." "Men love their country, not because it is great, but because it is their own." "Our flag is our national ensign, pure and simple, behold it! Listen to it! Every star has a tongue, every stripe is articulate." "A statistician made a few calculations and discovered that since the birth of our nation more lives had been lost in celebrating independence than in winning it." Visit Military OneSource today at http://www.militaryonesource.mil/ or call 1-800-342-9647."